Meet Henry, a well-meaning lad with no special powers whatsoever. In the first hour of The Witcher 3, as world-famous monster hunter Geralt of Rivia I cut down a mighty griffin with nothing but a sword and some bolts. In Kingdom Come: Deliverance, as Henry of nowhere in particular, I teamed up with some local lads to throw poo at a man's house. 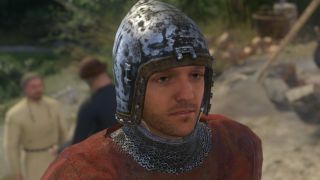 This is one of Kingdom Come: Deliverance's most charming qualities. Not the poo, I mean, but rather the game's determination to ground you in an unglamourous period setting where people can't fling fireballs around. You're not scanning the skies for dragons, you're scrabbling around for a few measly coins so you can buy a jerkin that doesn't make people turn their nose up at you in disgust. Henry is a blacksmith's son, which is admittedly the most cliched role for an RPG hero. The difference here is that, as far as I know, Henry isn't secretly a dragon or something. It's possible he might turn out to be the long-lost son of a King (I'm only a few hours in), but I really hope not, because it's novel for an RPG to put this much effort into simulating life at the bottom. Henry is a peasant in 1403, which means he can't read, can't fight very well, and no-one has ever taught him how to swim. The game features huge journals full of scene-setting and quest info for the player's benefit, but if anyone hands Henry a note in the game he won't be able to understand it. Get too close to running water and he remarks that he wishes he could swim. My first act in the game was to get beaten up by a drunk and then go home so my mum could fix me up. Henry is a little bit useless. He's also poor. You have to get out there and hustle for work, but stable employment with benefits isn't an option in the fields in 1403. Crime is a constant temptation, and the game tests your morality by dangling dodgy but lucrative offers in front of you. The way you respond to Henry's circumstances can change him from being a good lad to a dodgy sort, or, if you've really gone wrong, a rank geezer. Our reviewer Andy Kelly has taken to regularly mugging people he sees on the road travelling alone, just for the regular coin. I'm not there yet, but I have stolen some apples from a guy I didn't like. My life of crime starts here. Henry takes a sick burn to the face at point blank range. Henry's ineptitude applies to combat as well, initially, which raises the stakes on the road. A single plate armoured knight is a serious problem for Henry, as are badly armed bandits if they are rolling in a group. You can't chug a potion and start dodge-rolling around. The game teaches you early on that it's okay to run away. The thing is a guy like Henry, with no training, limited education, and a face like a potato, you probably should run. At least until you've bulked up on apples and hardened up on the mean, muddy streets. Kingdom Come: Deliverance takes a hands-off approach to all this. I haven't seen any morality-tracking mechanics and there aren't any companions hanging around to loudly judge you. Instead you just do what you have to do in the sandbox to stay alive. It reminds me more of off-the-beaten-path Oblivion experience, rather than more heavily scripted RPGs like The Witcher 3. This allows more room for roleplaying between missions, and for now I'm very much enjoying roleplaying an idiot. I'm sure the plot has big plans for Henry, but part of me hopes he never grows up so I can muddle my way through the middle ages like an extra in Blackadder. For more on Kingdom Come: Deliverance check out our review and beginner's tips. I'll leave you with an in-game message that I feel sums up Henry's life, in all its glory.